Victor “Punk” Woodley, the self-proclaimed “alpha of teabagging,” climbed ever higher up the world rankings in Street Fighter V by placing first last night at Dreamhack Austin. But despite his wins, Punk’s “alpha” side was nowhere to be seen in his final matches. Punk is known for taunting opponents, both in matches and during post-game interviews, and has a reputation of being smug. At Dreamhack Austin, the 18-year-old SFV phenom even brought literal teabags with his face printed on them. However, during his matches, Punk had many opportunities to crouch over his stunned opponents, and he chose instead to focus on the fight. Punk got knocked back to the loser’s bracket early on in the tournament, and once there, he won every single one of his matches until he solidified his place in the top three. In the loser’s bracket final, Punk faced faced Kun Xian Ho, who had just placed first in Final Round 20. It should have been a tough fight. Instead, Punk laid waste to Xian, hovering just out of range of each attack and swooping in to punish the whiffed blows. Ahead of Final Round 20 last March, Xian had switched characters from F.A.N.G. to Ibuki. His use of F.A.N.G. 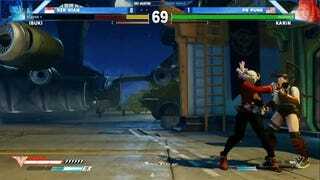 during the 2016 Capcom Pro Tour had been noteworthy, given that F.A.N.G. is not considered to be a strong character in SFV. Xian performed well with the character in spite of popular opinion, but after switching to Ibuki this year, he finally got a first place win in SFV. Since almost no F.A.N.G. players appear in high-level SFV play, Xian’s surprise pick could have confused Punk into making mistakes against an unfamiliar opponent. It’s the type of psychological tactic that Punk himself might employ, given how he has used teabagging to “get in certain people’s heads.” But the switch was too little, too late for Xian. Punk stayed on an even keel, using the same patient whiff-punishing that he’d used against Xian’s Ibuki. It was shocking to see Punk make such quick work of Xian, and so many other well-established SF veterans on the roster at Dreamhack. Also shocking: the polite behavior from the “alpha.” What was less shocking were the final matches between Punk and Haitani, which ended up more evenly balanced, with both pros trading rounds until Punk secured a very close win. Longtime Street Fighter commentator James Chen joked that, at age 18, Punk was too young to get into the Dreamhack after party. If last night’s tournament was any indication, though, Punk is growing up.